8.5 by 11 handmade paper of cotton rag with original, nature photography, suitable for framing. 8.5x11, handmade cotton rag paper with original, nature photography. These cards are 4/ 1/4 by 5 1/2 inches in size. No. 15 Handmade paper, handmade greeting cards, greeting cards, haiku cards, haiku. Tiger Swallow Tail - 20x30 handmade sheet on recycled coton rag and hemp. Gyotaku, Angelfish - Fish On handmade paper of recycled cotton rags, hemp, and sugar cane waste. Gyotaku, Angelfish Solo - 14x16 inch gyotaku print on handmade paper of recycled cotton rags, hemp, and sugar cane waste,. Three Fish gyotaku on handmade paper of recycled cotton rags, hemp and sugar cane waste. The Process me at work/play making a sheet in the Tibetan style. Marley, of Marley and me fame. Red gyotaku fish rubbing on hademade cotton rag paper. Handmade paper! I am addicted. These cards and paper sheets are all handmade by me in Ajo, Arizona. I also do the original cover photography on the cards such as the butterflies and grasses, etc. There are two methods of hand papermaking, European and Tibetan style. For the first four or five years I used the European technique. Almost every book or discussion of handmade paper concerns the European style where a mold and deckle are used in the dip and pull method of sheet formation. One day, my pulp supplier, Magnolia Editions in Oakland, Calif., sent me an email informing me that the non-profit group Paper Road Tibet would be sponsoring three Tibetan paper makers for a weekend, hands-on seminar in Tibetan style papermakig. Tibet is the cradle of hand paper making. When the political and military problems occurred in Tibet many refugees walked over the Himalayan mountains into such places as India and Nepal. These people brought their culture with them, including their paper making knowledge. Paper Road Tibet, a western non-profit in Washington, D.C.. that is no longer in existance, attempted to save this historic knowledge. Since that weekend seminar with the Tibetan paper makers, more than 15 years ago, all of the paper I make has been made in that style. All of the paper I make here for my Etsy shop is made in the Tibetan style. The technique is described below. The procss does not use a deckle or the dip and pull method and the wet pulp is not removed from the mold while the paper dries. I started making paper for my own use but folks were soon asking if they could buy some so I made more. and more and you get the idea. To make a card first I gather the fibers I want to use. In this case, I want to use recycled cotton rags (socks, shirts, blouses, etc. ), hemp for strength and some sugar cane waste, just because I have access to some and it turns out, makes a great paper. Then, I have to know the correct proportion of each fiber to mix together to get the desired sheet. If there is too much cotton content then the resulting paper will be too soft and if the hemp content is too high the paper will be too hard and stiff for these purposes. Outside, I have a wooden tub about ten inches high that is partially filled with water where I float a typical papermaker's mold upside down, as this the Tibetan style of papermaking. A measured amount of carefully mixed pulp is poured into the mold along with whatever wildflower petals or natural inclusions I may be using for that particular sheet. Once I have dispersed the fibers evenly across the 30x20 inch mold I pull the sheet and set it to dry. After drying, about 3 or 4 hours, I peel the dried paper from the mold and tear it into 8.5x11 sheets that will fit my inkjet printer. Next, I put my photography skills to work by photographing the butterflies or flowers to use on the cover of the card. I use Photoshop to remove the background so there is nothing left except the butterfly, etc. I will photograph grasses, leaves, flower petals, etc. and use Photoshop to delete the background so that only the plant part is left visible and then make different layouts using different Photoshop layers to be run through the printer. 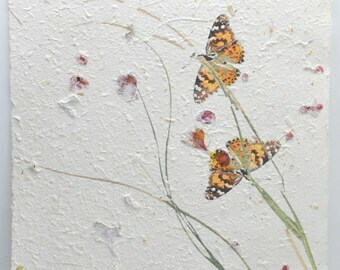 So the resulting image is a pleasing combination of my nature photography, printed and 3-D flowers and other inclusions. I guarantee that you will love my work. If you don't, just send it back and I will refund your money, no questions asked. Hi, and welcome to Sonoran Paper. Glad you stopped for a visit. As you probably know, I make paper and greeting cards. Hope I am making one for you. If not, tell your friends about these beautiful cards and paper and that I offer free shipping and money back guarantees. I will happily refund any order without questions if you return the paper or note cards. No questions asked. I accept all credit cards in addition to money orders or checks. If you are not completely satisfied with my paper or haiku cards just return them and I will gladly refund your money, no questions asked. Free shipping to the U. S.
International customers must add $10 usd. Sorry, but internatinsl shipping is just so expensive. A one ounce card shipped to Europe costs me $15.00 so while I want everyone to enjoy my paper and cards I just can't afford to pay the total costs of international shipping. Because of the time and effort I put into each card. At this time I can only produce twenty cards per day. Where do the flower inclusions come from that you use in the cards? They are gathered locally to Ajo, Arizona. That is in southwest Arizona/Sonoran Desert. Can I paint on your paper? It will take acrylics and oils ok but not so much for watercolor. What fibers do you use in your paper and cards? I use recycled cotton rags, cotton linters, hemp fibers for strength and sugar cane waste, when available. What if I don't like the cards I receive? What you see is what you get but send them back for a full refund.